Are YOU sick and tired of putting things off? Do YOU stop every time you start? NOW it’s time for YOU to Enjoy being organised and efficient and getting things done. EARLY! Your life doesn’t have to be a long history of unfinished projects, piles of paper, messy rooms, and self sabotage. These changes can NOT be achieved by reading a book, creating a system, or making a list. These changes can be made by reprogramming the core cause of procrastination, self sabotage, and even lack of motivation. When the core causes are released and resolved, you can create powerful programming in your subconscious mind that will push you forward with energy and joy and focus, to get your life in order and make you LOVE to DO IT NOW. Get rid of the fear that is fuelling your need to put things off. Throw it Away – Let go… you can do it. The accumulation of stuff makes our lives heavy. When you look at something that needs to be put away you will feel an instant feeling of joy as you put it away, organise it, or toss it! 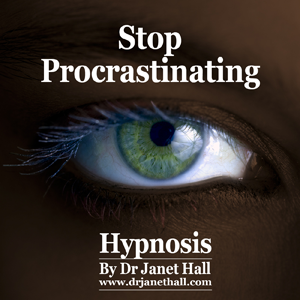 End clutter and procrastination once and for all with this hypnosis recording. You CAN have the neat house, clean and organized home, office and life that you desire. You CAN finally start — and complete — that project. You CAN make procrastination a memory! End the self-sabotaging behaviour by eliminating it at its core, deep in your subconscious mind. All habitual behaviour exists in your subconscious, so you KNOW that you can’t change your habitual procrastination through conscious efforts like post it notes and reminder emails and lists. The secret lies in your mind, and creating alignment between what you consciously want, and your subconscious habits. That is what hypnosis does. A feeling of alignment and agreement–a peaceful feeling of not fighting yourself anymore. So, if you’re serious about wanting to stop procrastinating then you need to get a copy of “Stop Procrastinating With Hypnosis” right now!